The Malti-poo? 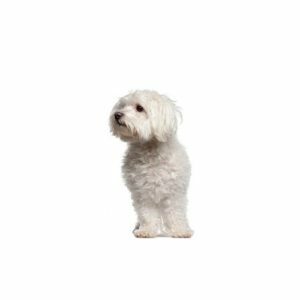 ?is a mix of Maltese and Toy or Miniature Poodle and may inherit the two breeds' traits of being affectionate, and friendly. They are meant to be companion dogs, creating strong bonds with their people. As with any mixed breed, they may or may not have the desirable traits of each parent breed. The Malti-poo is? ?meant to be outgoing, friendly and low shedding. Malti-poos have alert, expressive faces and a puppy-like demeanor. They are generally up to 14 inches tall and can weigh anywhere from 5-15 pounds. Coats vary from straight to curly or wavy and are usually white or cream, although color varies as well. They should be brushed several times a week to prevent matting and snarls. In common with both parent breeds, Malti-poos are energetic, smart and spunky. Both Poodles and Maltese are agile and trainable, especially with reward-based training. The Malti-poo is always up for a game or a good chase around the yard. A brisk walk once or twice a day is also beneficial. Because of his size and energy level, he can live almost anywhere and is perfectly happy in a small apartment. Malti-poos become extremely attached to their family and don?۪t like being left alone. They are prone to separation anxiety and may become destructive or depressed when separated from their people. They do best in a household where someone is with them most of the time. Since both the Poodle and Maltese are intelligent breeds, Malti-poos may inherit that intelligence. With the right kind of training, they may do well in agility and obedience trials, love learning tricks and make good therapy dogs. But they?۪re also sensitive and only respond well to positive, kind training. Reward him with treats and enthusiastic praise and he?۪ll look forward to training sessions. He?۪ll learn quickly and will proudly show off all his tricks. Do you think a Malti-poo puppy could be right for you and your family? Check out our available puppies page to see all our adorable Malti-poo puppies for sale! Are you interested in purchasing a Malti-Poo?